From the 2nd of February till the 4th of February, our Kick-Off-Meeting was held at the Karlsruhe Institute of Technology (KIT) in Karlsruhe, consisting of the General Assembly on the first day and a more informal scientific work shop on the additional days. We took care of formal issues like the expected work for the deliverables ahead, an introduction to all work packages and a brief discussion on milestones and possible project risks in the General Assembly first. Especially the discussion about the System Architecture with its different interfaces and components gave us a shared understanding of the SafeLog System. During the work shop, a more in-depth look into the peculiarities of the work packages and the technologies envisaged for followed. There we focused in groups on the topics Safety Concept, Safety Vest, Heterogeneous Fleet Management and Augmented Reality. The third day, during which an update on the interconnection between the tasks could be developed, finalized the meeting. 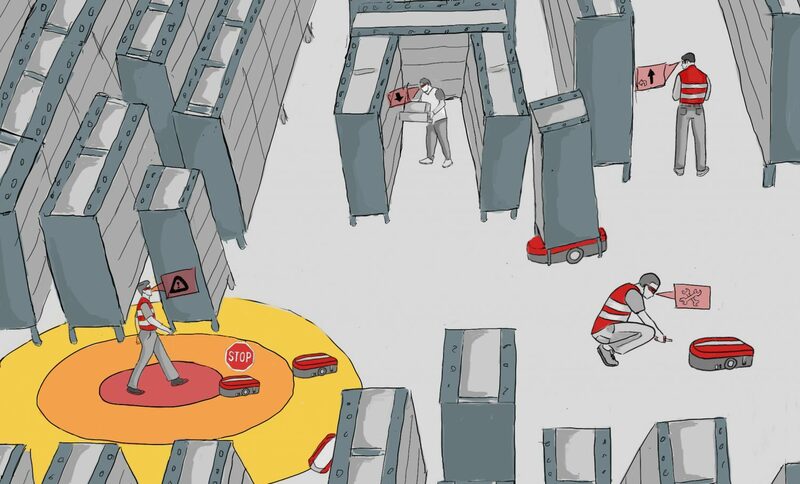 On the 1st of February , a visit at a 3PL (third-party logistics) warehouse at an e-commerce company enabled us to get a hands-on approach to the problems persons working in a highly automated and innovated warehouse are facing today.